Textile technologies can be utilized to design and develop fibrous scaffold structures for various tissue engineering applications. 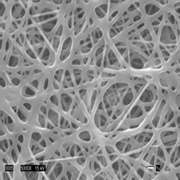 Different textile structures have the versatility to tailor their architecture, enabling to control unique properties including fiber size and orientation, matrix size and shape, pore size and geometry, total porosity and pore interconnectivity, and surface topography, all of which influence subsequent mechanical properties and biocompatibility of the scaffolds. Such technologies include melt spinning, nonwovens, knitting, weaving, braiding, flocking and electrospinning.